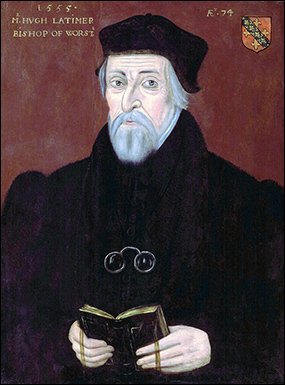 HUGH LATIMER, English bishop, and one of the chief promoters of the Reformation in England, was born at Thurcaston, Leicestershire. He was the son of a yeoman, who rented a farm "of three or four pounds by year at the uttermost." Of this farm he "tilled as much as kept half a dozen men," retaining also grass for a hundred sheep and thirty cattle. The year of Latimer's birth is not definitely known. In the Life by Gilpin it is given as 1470, a palpable error, and possibly a misprint for 1490.1 Foxe states that at "the age of fourteen years he was sent to the university of Cambridge," and as he was elected fellow of Clare in 1509, his year of entrance was in all likelihood 1505. Latimer himself also, in mentioning his conversion from Romanism about 1523, says that it took place after he was thirty years of age. According to Foxe, Latimer went to school "at the age of four or thereabout." The purpose of his Parents was to train him up "in the knowledge of all good literature," but his father "was as diligent to teach him to shoot as any other thing." As the yeomen of England were then in comparatively easy circumstances, the practice of sending their sons to the universities was quite usual; indeed Latimer mentions that in the reign of Edward VI, on account of the increase of rents, the universities had begun wonderfully to decay. He graduated B.A. in 1510 and M.A. in 1514. Before the latter date he had taken holy orders. While a student he was not unaccustomed "to make good cheer and be merry," but at the same time he was a punctilious observer of the minutest rites of his faith and "as obstinate a Papist as any in England." So keen was his opposition to the new learning that his oration on the occasion of taking his degree of bachelor of divinity was devoted to an attack on the opinions of Melanchthon. It was this sermon that determined his friend Thomas Bilney to go to Latimer's study, and ask him "for God's sake to hear his confession," the result being that "from that time forward he began to smell the word of God, and forsook the school doctors and such fooleries." Soon his discourses exercised a potent influence on learned and unlearned alike; and, although he restricted himself, as indeed was principally his custom through life, to the inculcation of practical righteousness, and the censure of clamant abuses, a rumour of his heretical tendencies reached the bishop of Ely, who resolved to become unexpectedly one of his audience. Latimer, on seeing him enter the church, boldly changed his theme to a portrayal of Christ as the pattern priest and bishop. The points of comparison were, of course, deeply distasteful to the prelate, who, though he professed his "obligations for the good admonition he had received," informed the preacher that he "smelt somewhat of the pan." Latimer was prohibited from preaching in the university or in any pulpits of the diocese, and on his occupying the pulpit of the Augustinian monastery, which enjoyed immunity from episcopal control, he was summoned to answer for his opinions before Wolsey, who, however, was so sensible of the value of such discourses that he gave him special licence to preach throughout England. At this time Protestant opinions were being disseminated in England chiefly by the surreptitious circulation of the works of Wycliffe, and especially of his translations of the New Testament. The new leaven had begun to communicate its subtle influence to the universities, but was working chiefly in secret and even to a great extent unconsciously to those affected by it, for many were in profound ignorance of the ultimate tendency of their own opinions. This was perhaps, as regards England, the most critical conjuncture in the history of the Reformation, both on this account and on account of the position in which Henry VIII then stood related to it. In no small degree its ultimate fate seemed also to be placed in the hands of Latimer. 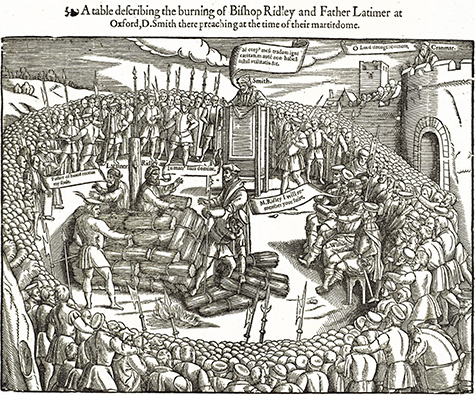 In 1526 the imprudent zeal of Robert Barnes had resulted in an ignominious recantation, and in 1527 Bilney, Latimer's most trusted coadjutor, incurred the displeasure of Wolsey, and did humiliating penance for his offences. Latimer, however, besides possessing sagacity, quick insight into character, and a ready and formidable wit which thoroughly disconcerted and confused his opponents, had naturally a distaste for mere theological discussion, and the truths he was in the habit of inculcating could scarcely be controverted, although, as he stated them, they were diametrically contradictory of prevailing errors both in doctrine and practice. In December 1529 he preached his two "sermons on the cards," which awakened a turbulent controversy in the university, and his opponents, finding that they were unable to cope with the dexterity and keenness of his satire, would undoubtedly have succeeded in getting him silenced by force, had it not been reported to the king that Latimer "favoured his cause," that is, the cause of the divorce. While, therefore, both parties were imperatively commanded to refrain from further dispute, Latimer was invited to preach before Henry in the Lent of 1530. The king was so pleased with the sermon that after it "he did most familiarly talk with him in a gallery." Of the special regard which Henry seemed to have conceived for him Latimer took advantage to pen the famous letter on the free circulation of the Bible, an address remarkable, not only for what Froude justly calls "its almost unexampled grandeur," but for its striking repudiation of the aid of temporal weapons to defend the faith, "for God," he says, "will not have it defended by man or man's power, but by His Word only, by which He hath evermore defended it, and that by a way far above man's power and reason." Though the appeal was without effect on the immediate policy of Henry, he could not have been displeased with its tone, for shortly afterwards he appointed Latimer one of the royal chaplains. In times so "out of joint" Latimer soon became "weary of the court," and it was with a sense of relief that he accepted the living of West Kington, or West Kineton, Wiltshire, conferred on him by the king in 1531. Harassed by severe bodily ailments, encompassed by a raging tumult of religious conflict and persecution, and aware that the faint hopes of better times which seemed to gild the horizon of the future might be utterly darkened by a failure either in the constancy of his courage or in his discernment and discretion, he exerted his eloquence with unabating energy in the furtherance of the cause he had at heart. At last a sermon he was persuaded to preach in London exasperated John Stokesley, bishop of the diocese, and seemed to furnish that fervent persecutor with an opportunity to overthrow the most dangerous champion of the new opinions. Bilney, of whom Latimer wrote, "if such as he shall die evil, what shall become of me?" perished at the stake in the autumn of 1531, and in January following Latimer was summoned to answer before the bishops in the consistory. After a tedious and captious examination, he was in March brought before convocation, and, on refusing to subscribe certain articles, was excommunicated and imprisoned; but through the interference of the king he was finally released after he had voluntarily signified his acceptance of all the articles except two, and confessed that he had erred not only "in discretion but in doctrine." If in this confession he to some extent tampered with his conscience, there is every reason to believe that his culpable timidity was occasioned, not by personal fear, but by anxiety lest by his death he should hinder instead of promoting the cause of truth. After the consecration of Cranmer to the archbishopric of Canterbury in 1533 Latimer's position was completely altered. A commission appointed to inquire into the disturbances caused by his preaching in Bristol severely censured the conduct of his opponents; and, when the bishop prohibited him from preaching in his diocese, he obtained from Cranmer a special licence to preach throughout the province of Canterbury. In 1534 Henry formally repudiated the authority of the pope, and from this time Latimer was the chief co-operator with Cranmer and Cromwell in advising the king regarding the series of legislative measures which rendered that repudiation complete and irrevocable. It was, however, the preaching of Latimer more than the edicts of Henry that established the principles of the Reformation in the minds and hearts of the people; and from his preaching the movement received its chief colour and complexion. The sermons of Latimer possess a combination of qualities which constitute them unique examples of that species of literature. It is possible to learn from them more regarding the social and political condition of the period than perhaps from any other source, for they abound, not only in exposures of religious abuses, and of the prevailing corruptions of society, but in references to many varieties of social injustice and unwise customs, in racy sketches of character, and in vivid pictures of special features of the time, occasionally illustrated by interesting incidents in his own life. The homely terseness of his style, his abounding humour — rough, cheery and playful, but irresistible in its simplicity, and occasionally displaying sudden and dangerous barbs of satire — his avoidance of dogmatic subtleties, his noble advocacy of practical righteousness, his bold and open denunciation of the oppression practised by the powerful, his scathing diatribes against ecclesiastical hypocrisy, the transparent honesty of his fervent zeal, tempered by sagacious moderation — these are the qualities which not only rendered his influence so paramount in his lifetime, but have transmitted his memory to posterity as perhaps that of the one among his contemporaries most worthy of our interest and admiration. In September 1535 Latimer was consecrated Bishop of Worcester. While holding this office he was selected to officiate as preacher when the friar, John Forest, whom he vainly endeavoured to move to submission, was burned at the stake for denying the royal supremacy. In 1539, being opposed to the "act of the six articles," Latimer resigned his bishopric, learning from Cromwell that this was the wish of the king. It would appear that on this point he was deceived, but as he now declined to accept the articles he was confined within the precincts of the palace of the bishop of Chichester. After the attainder of Cromwell little is known of Latimer until 1546, when, on account of his connexion with the preacher Edward Crome, he was summoned before the council at Greenwich, and committed to the Tower of London. Henry died before his final trial could take place, and the general pardon at the accession of Edward VI procured him his liberty. He declined to resume his see, notwithstanding the special request of the Commons, but in January 1548 again began to preach, and with more effectiveness than ever, crowds thronging to listen to him both in London and in the country. Shortly after the accession of Mary in 1553 a summons was sent to Latimer to appear before the council at Westminster. Though he might have escaped by flight, and though he knew, as he quaintly remarked, that "Smithfield already groaned for him," he at once joyfully obeyed. The pursuivant, he said, was "a welcome messenger." The hardships of his imprisonment, and the long disputations at Oxford, told severely on his health, but he endured all with unbroken cheerfulness. On the 16th of October 1555 he and Ridley were led to the stake at Oxford. Never was man more free than Latimer from the taint of fanaticism or less dominated by "vainglory," but the motives which now inspired his courage not only placed him beyond the influence of fear, but enabled him to taste in dying an ineffable thrill of victorious achievement. Ridley he greeted with the words, "Be of good comfort, Master Ridley, and play the man; we shall this day light such a candle by God's grace in England as (I trust) shall never be put out." He "received the flame as it were embracing it. After he had stroked his face with his hands, and (as it were) bathed them a little in the fire, he soon died (as it appeared) with very little pain or none." at two o'clock in the morning. Encyclopedia Britannica, 11th Ed., vol. XVI. Cambridge: Cambridge University Press, 1910. 243. Created by Anniina Jokinen on September 16, 2006. Last updated February 7, 2007.